With Memorial Day Weekend over, we are now into the nitty-gritty of the summer movie season, with blockbusters (at least potential ones) arriving every week. One of the films arrives as Oscar bait, although the rest of this week's offerings do not have such a lofty goal. 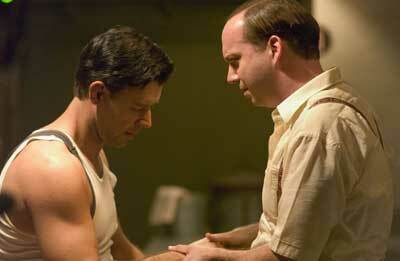 Cinderella Man is the second collaboration between Ron Howard and Russell Crowe, and features Crowe as Depression-era boxer Jim Braddock. His comeback run in the early '30s is credited with lifting the spirits of many in what clearly wasn't a happy time, although it might be pointed out that the Depression lasted five years after he regained his form. I guess he would have been more effective if he'd declared war on Germany and Japan. The trailer practically has "For Your Consideration" stamped at the top, with stirring music, sepia-toned scenes, and an audience friendly story arc, nearly completed by the time "June 3rd" comes up on screen. It's tempting to compare it to last year's Best Picture winner Million Dollar Baby, but the natural comparison has to be Seabiscuit, another Depression-era underdog story. That film opened on just under 2,000 screens to about $20 million and went on to earn $120 million total, with a newly famous Tobey Maguire and Jeff Bridges as its main human draws.